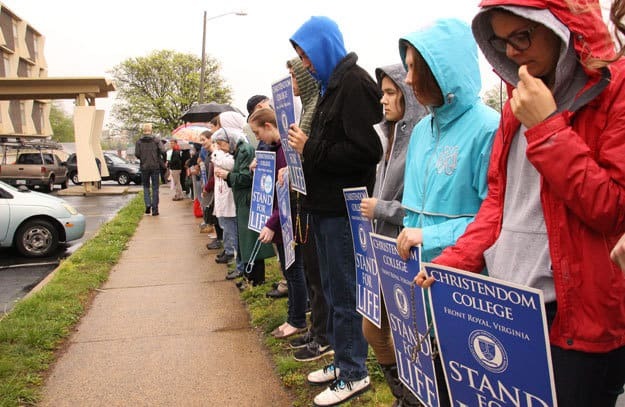 Over a hundred Christendom College students stood outside an abortion clinic in the rain to prayerfully protest abortion this past weekend. The semesterly event, dubbed “Mega Shield,” is one of the college’s most popular, with the students present praying numerous rosaries and counseling women at the Planned Parenthood clinic in Falls Church, Virginia. The students were joined by Bishop Michael Burbidge of the college’s home Diocese of Arlington, who celebrated Mass for them in the morning before praying with them at the clinic. “It was awesome seeing Bishop Burbidge there, and he was very impressed and joyful in seeing the response and presence of Christendom College on a Saturday morning,” says Love. While Mega Shield only occurs once a semester, the Shield of Roses group travels out to a Planned Parenthood clinic in the nearby D.C. area every Saturday morning during the academic year to prayerfully protest. Multiple clinics that have been prayed at have closed over the years, including one in Silver Spring, Md. just this semester.